The Lufft I-BOX family increases: The hardware has been enhanced with an interface and there is a suitable new cloud offering. With this, the Lufft I-BOX paves the way to meteorology. The majority of Lufft measuring instruments can be connected via plug and play. The Lufft I-BOX expands the Lufft sensors with communication variety, which is needed by customers who want to transfer the measurement data from Lufft sensors into their own applications. It is the intermediate piece between Lufft sensors and customer systems. The further use of data within the individual customer IT systems and the integration capability is getting an increasingly important criteria for the selection of sensors and systems. The reasons are complex, be it documentation requirements, the link to intelligent alert systems or the feeding of prognosis and automation procedures. 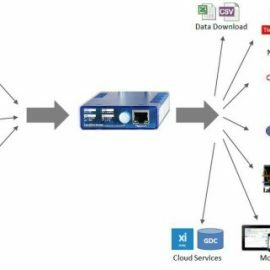 The central challenge of it is the control of the complexity: different protocols, data formats or interface standards make it tough for users who often aren’t IT experts, to install and maintain the sensor integration. With the Apps the Lufft I-Box strikes out in a new direction: The technology revolutionizing smartphones, is transferred to the measurement technology with through the Lufft I-Box. Apps are small functional modules, which can be assembled to a desired overall function. IN-Apps ensure to get or receive the measurement data from the sensor and to save it in the Lufft I-BOX. SYS-Apps can perform alerts and are capable of the fundamental extension of the app system. OUT-Apps are the interfaces to the outer world: they can display data in browsers, export them into customer data bases, show them in SmartGraph/ SmartView or download them in CSV respectively excel formats. The apps make complicated programming for the sensor’s data integration or special knowledge regarding sensor protocols unnecessary. With a web based user interface all functions are shown clearly arranged and can be changed easily. 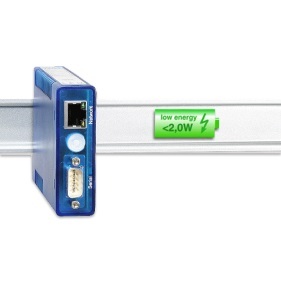 As the first Lufft I-Box relied on a sensor communication via Ethernet (e.g. for OPUS20), the new Lufft I-Box serial can now be linked through serial interfaces directly. The serial interface supports RS232, RS422 and RS485. In connection with Lufft, the communication will be supported by ISOCON (RS-232). The direct communication will be released soon. The configuration can be performed in a web browser via plug-and-play principle. For every sensor there is a suitable App. The configuration is limited to the necessary parameters and can be carried out from non-IT-experts easily. Detailed knowledge about the UMB technology isn’t required any longer. The Lufft I-Box can be linked to several different sensors at once and for each sensor only the necessary channels must be chosen. The measurement data are determined by the sensors and saved in the Lufft I-Box. Through this the channels of all sensors are available for further handling, for which the SYS and OUT apps can be used. With the Lufft I-Box serial also the challenge to unite measurement locations at spatially spread locations can be solved simply. What suggests itself more than a data cloud? 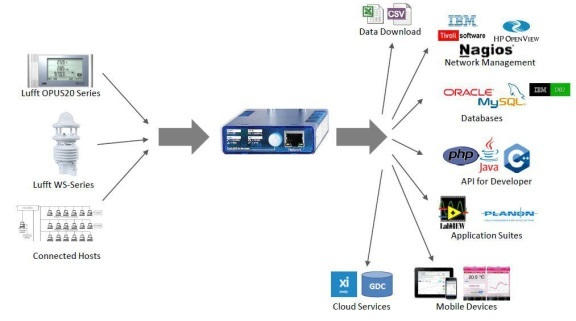 The Lufft I-Box Cloud was created to save measurement data centrally and make it available at one place. Customers can access their data without own server hardware or operating procedures. Static IP addresses or DynDNS are not necessary, because the Lufft I-Box sends the data actively. The data transport can take place in short terms or longer terms – according to the requirements. The measurement values are buffered in the Lufft I-Box until the connection works again. 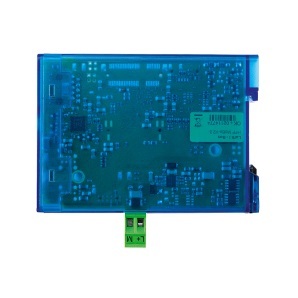 Thus, the data transfer can be ensured even for less reliable connections. From there, the data can be watched on a screen and can be analyzed interactively, or can be transferred directly to the customer system (data base, SAP). Examples for such installations are the newly opened Rotenflue-mountain railway or the meteorological station of Mostelbarg-Sattel. Both measurement stations are used by weather expert Joerg Kachelmann for prognosis processes. There also 360° cameras were integrated. The whole station consists of weather, cloud height sensors, Ventus and visibility sensors. In the valley station big displays are placed, showing the actual weather situations to the skiers. The desired apps can be found in the virtual Lufft App Store under Lufft-I-Box.com. For all fields of application specific apps are available and can be used on every platform. Through this, widely varying sensor integrations tasks can be solved. From on-site measurement data display solutions to building management integration systems or solar plant control systems – the Lufft I-Box can handle all of these! The experiences from the mobile phone market show, that arising potentials can only be described limitedly in the beginning. Practical experiences, pilot projects and user experiences are expedient. And in case more measurement data processing related tasks will follow: this means no problem due to the fact that apps can be added afterwards. The Lufft I-Box system can be adapted to changing conditions and requirements elegantly. Even if the cloud is not an issue in some areas today, the way to this can be easily achieved, whenever it becomes actual – just as flexible as the always changing environment. My name is Wolfgang Clauss. I am the owner of Ondics GmbH. We support our customers in the best possible use of web and app technologies. It is fun to develop innovative concepts and thus taking customers into new areas – from concept to commercial success. We, Ondics GmbH, are partners of the G. Lufft measuring and control technology GmbH and the producer of Lufft I-BOX product family.